news Former US whole of government chief information officer Vivek Kundra will hit Australia over the next several weeks for a speaking tour that will include events for his new employer Salesforce.com, as well as the Australian Information Industry Association. Kundra has a long history working within government organisations at various levels in the US. He served as the director of infrastructure technologies at Arlington Country in Virginia in the early years of this decade, for example, before later becoming the state’s assistant secretary of commerce and technology. After that time he became the chief information officer of the District of Columbia. He had also spent time as the vice president of software firm Evincible. 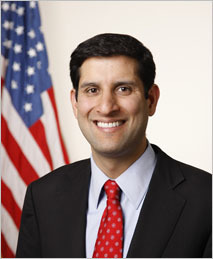 When US President Barack Obama won the 2008 US election, Kundra was appointed to be the president-elect’s technology advisor. He was then named to the post of Federal chief information officer in March 2009, several months after Obama himself took office. Kundra’s time in the US Government saw him preside over a number of major changes which have caused wider global ripples within the public sectors of countries such as Canada, the UK and Australia. Kundra, for example, was responsible for creating a whole of government IT dashboard through which government staff could easily gain a birds’ eye view of all major projects and IT expenditure across all departments. Part of the project was that each project had a picture of the accountable executive attached to it — usually a departmental chief information officer. The technology behind the dashboard is publicly available so that other jurisdictions can adopt it. Another initiative undertaken by the US Government under Kundra was an initiative he dubbed “TechStat”. The TechStat toolkit was also made publicly available alongside the IT Dashboard. As detailed in a very useful article on the subject published by InformationWeek, TechStat sessions see an agency’s CIO and CFO, central government analysts and officials from related departments brought together with staff from the central whole of government office of the CIO to rapidly examine and evaluate the status and future prospects of a major IT project. In many cases, after reviewing a project’s current status and likely future, the government decision-makers simply cancelled the projects or rolled them into other similar iniatives in different departments. Kundra was also responsible for pioneering a ‘cloud first’ strategy in the US Government which saw agencies required to evaluate cloud computing options prior to making any new investments in IT. However, Kundra’s tenure within the US administration did not last long, with the executive leaving the government just two years after he joined it, in August 2011. He then joined Harvard University as a visiting fellow, before being announced as executive vice president of emerging markets for cloud computing vendors Salesforce.com in January this year. Kundra’s time was not without controversies. A survey of IT professionals in government by online IT community MeriTalk published in September heavily criticised the executive. “Vivek’s tenure … was like a bottle of champagne — seems like a great idea, exciting start, but the plan’s unclear, and the next morning you wake up with the same problems and a sore head,” said Steve O’Keeffe, founder, MeriTalk, at the time. In Australia, Kundra will speak at a press event in Sydney being held by Salesforce.com on Monday 13th February, and at the AIIA’s Cloud Summit in Canberra the following Wednesday. Kundra’s tour of Australia has already attracted a degree of controversy, however. However, it is believed that the AIIA was not aware at the time that Kundra would be in January appointed a senior executive at Salesforce.com. It is unclear to what extent Kundra will be speaking at the event as a Salesforce.com executive, and to what extent he will be speaking as a former US Government chief information officer. I was invited to attend Kundra’s press event in Sydney being held by Salesforce.com. However, I have declined to attend. In addition, I will not be reporting on anything that Kundra says at the AIIA’s event in Canberra, or on any other events that the executive speaks at in Australia. In short, I have decided that Delimiter will be boycotting coverage of Kundra’s attendance in Australia. The reason is that I am personally highly disappointed in Kundra’s somewhat cynical early departure from the US Government and into the welcoming arms of leading cloud computing vendor Salesforce.com. Kundra had a once in a lifetime chance, with his ascension to the CIO role in the new Obama administration, to make a great deal of systemic change in the US Government’s use of technology. And he brought a huge degree of effort, energy and innovative thinking to that initiative in the two short years he was in the post — creating several landmark programs which continue to have an impact on public sector technology thinking globally. But then Kundra instantly undercut all of that good work by not following through on his efforts. After just two short years — which is a miniscule amount of time for the slow-moving public sector — the executive abandoned the US Government to its own devices and switched sides to work for a cloud computing vendor. Kundra had a direct connection to the administration in the form of US President Obama. By leaving the Government, he left IT executives across the US public sector without that sort of high-level sponsorship for their initiatives. And by joining Salesforce.com, he has invalidated his government ‘Cloud First’ cloud computing push. Many within the US Government will be wondering to what extent Kundra was thinking of his future career when he made that push. We’ve seen similar examples of top-level government IT executives joining vendors, with the most notable example being former Queensland Government chief information officer Peter Grant, who left his role in 2008 to become the State Director of Microsoft, a role he held for just over a year. In December Grant was reappointed to Queensland Government CIO role. However, Grant stuck around in the Qld Govt CIO role for longer (three years, compared with two) than Kundra did in the US Govt role, and he was obviously overseeing less dramatic change than Kundra was in the US, whose Federal public sector is an order of magnitude larger than anything we see in Australia. My opinion is that Kundra should have stuck it out in the US for at least the first term of the Obama administration, and a second term if Obama won it. That way he could have driven real change in the US Government which would have affected generations of residents. Six years in government is about enough time to get some decent stuff done. Anything less is probably not enough. In Australia, we do have some examples of public servants who have gone beyond the call of duty in serving the cause of technology in government. One of those is Department of Defence chief information officer Greg Farr, who helped completely reform the Australian Taxation Office’s IT operations and is now doing the same at Defence. Farr’s history within Australia’s government dates back a long time and recently earned him a Public Service Medal in the Australia Day honours. Now that’s public service worth listening to. A US presidential term is four years, not three, which would amount to eight years in government. I think in this case you have got it wrong. I went to the AIIA event in Canberra and thought it was a well considered program. Vivek himself is impressive – he shows humility, and espouses a Cloud-First strategy. I found myself feeling really vindicated for the message I have been sharing for so many years now. In relation to the point about his role, it was clear he was role- and company- agnostic – his mission was to open the eyes of the (predominantly government) audience to the benefits to the world as a whole around Cloud adoption. Often he raised the scope of a question, lifting people’s vista graciously but emphatically, admonishing limiting thinking. The US government had sent several representatives and had some high profile protagonists attend and speak on the truth behind the Patriot Act, and there were lots of myths debunked it seems. As for the point about him abandoning his post, After reading your article I thought you had a point, but having seen the man and talked to him in person, I now totally disagree. In fact, I think what he has done may, paradoxically, work to bring even greater leverage and adoption to the Cloud-first agenda both in the US administration as well as other administrations around the world. His words speak to that in an honest and powerful way, and his new title as head of Public Sector and Emerging Markets testifies to this vision. The key achievement of establishing new paradigms, new approaches to significant problems (an $80Billion budget!) is well in hand. By staying around to implement on post-paradigming shifting reforms may well have weakened those very reforms, or at least the perception thereof. Watching him, I can really get a sense that he can potentially make an even bigger difference inside by being now outside. Having said that, I think there is a honeymoon period for him, and it is very well possible that he may fade into obscurity in Salesforce. But judging on the continued respect he earns from the US government representatives, and his clear intellect, lack of hubris, and courage to not accept the status quo, combined with his track record, I think he is going to continue to make a difference. By the time he isn’t, he will have found another way to make a difference. I really wish you had have adopted a different approach in this case.